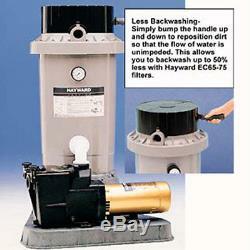 Hayward ec65 system w/ 1 hp super pump perlex de filter system. Extended-cycle de filter systems - inground. The perflex extended-cycle de filter series cleans pools fast - removing particles as small as one micron the first time through. That's because perflex incorporates a patented flex-tubet design that works in combination with de (diatomaceous earth) filter powder to produce the clearest, most sparkling water possible. The exclusive perflex extended cycle gives you long filter cycles between cleaning - up to eight weeks depending on pool size and use. Because the same filter powder is used over and over again, perflex is a real work saver. And, it only takes minutes to extend the cycle. Perflex filters stretch your dollars too! Since perflex cleans without backwashing, you save hundreds of gallons of treated pool water. Plus, perflex saves on electricity because its efficient design offers less resistance to flow and produces more filtered water with less pump horsepower. Here's how it works. Perflex filters use diatomaceous earth filter powder commonly called d. , which will remove particles as small as one micron, and is the most efficient dirt remover known. It will even remove microscopic dust and pollen. When the filter is initially started, diatomite filter powder is fed into the system, usually through the skimmer. As the water passes through the flex-tubes, the filter powder is automatically deposited on the outside of the flex-tubes, forming the working "filter surface". Similarly, dirt in the water is stopped on the surface of the filter powder. Eventually, the accumulated dirt causes the filter pressure to rise flow to diminish. This is when ordinary filters need backwashing. Simply activate the perflex "bump" handle, and within a minute, flow and pressure are back to normal. In-ground pools of all types and sizes. Exclusive bump handle activates the mechanism causing the flex-tubes to instantly and uniformly clean themselves of dirt and filter powder. Self-venting design automatically expels any air that may be present in the system. Proven, patented flex-tube filter elements efficiently reuse the filter powder and dirt mixture forming a fresh filtering surface. Combination pressure gauge and threaded inspection/service port is easy to read and remove when filter needs cleaning. Heavy-duty filter tank injection-molded of high-strength duralont for dependable, corrosion-free performance. Integral check valve prevents system backflow whenever pump is off. System lll base pak for ec65/ec75 (less pump) - for super, super ii t or max-flo t pumps. Order super, super ll or maxflo pump, ec65a or ec75a basic filter and ec65blp for a 3 component system. Examples: ec65a or ec75a filter with super pump® series with u. Pump and union base (3 cartons). Customers who have shopped with us before can tell you. Offers the finest, most innovative and most effective items for your pool, spa, backyard and home. We only sell products that meet our strict standards for quality, function and value. Specialty pool products also promises you. We are unable to make changes or cancellations to orders after they are placed. At spp, your satisfaction is always our primary concern. Specialty pool products does not rent or sell its customer list.The item "Hayward EC65A Inground Swimming Pool DE Filter System With1HP SP2607X10 Super Pump" is in sale since Wednesday, June 18, 2014. This item is in the category "Home & Garden\Yard, Garden & Outdoor Living\Pools & Spas\Pool Parts & Maintenance\Pool Filters".com" and is located in United States.